We released Carbide Copper in early April. 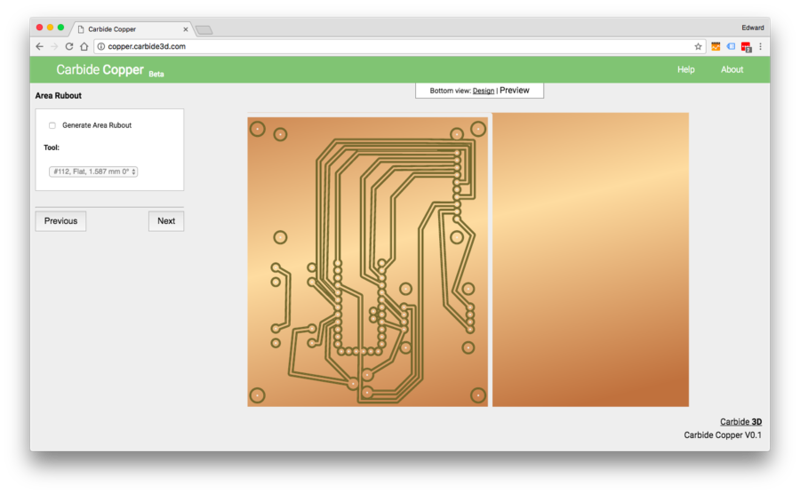 Copper is a web app that lets you easily create PCBs on your home CNC machine by simply dragging and dropping Gerber files. In the time since the initial release, I’ve talked to a lot of people about Copper, and the overwhelming response from the non-engineer crowd is simply: “Cool, but why would I make a PCB?”. 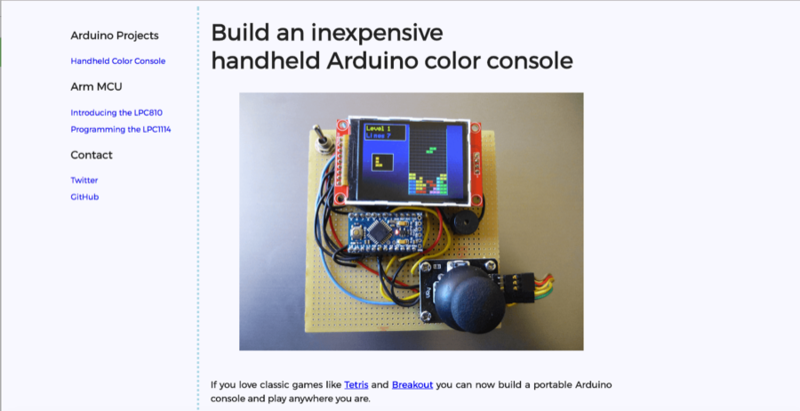 I’ve been playing around with Arduino since Tom Igoe released his ‘Making Things Talk’ book through O’Reilly media in 2007. And in that time, I have made lots of cool projects with them: GPS dog collars, bike computers, every sensor imaginable, radios, along with a host of others. Needless to say, Arduino and I have a history together. With that said, overwhelmingly the only problem I had with any of my projects was purely logistical. When your project lives on a breadboard, there’s not much you can do with it after the project is completed. Portability (and stability) are issues, as is any sort of permanence. To solve this, a lot of us get creative. And by creative, I mean a lot of us learned to use hot glue to shove everything into a box, and keep it secure. That works, but it too has its limitations. And don’t get me started on those project boxes right now. Another option is to use perf board. 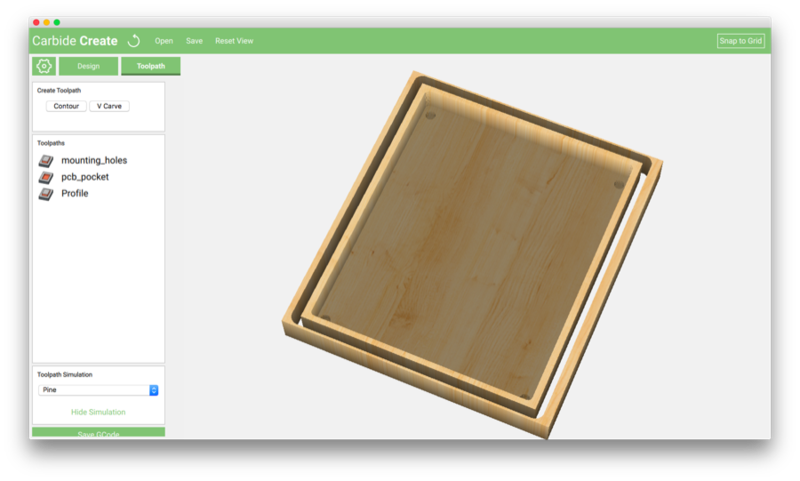 Perf board is a great way to turn a breadboard project into something you can move around a little more securely. But, I will argue that in the same amount of time it takes you to lay out and solder together a perf board, you cold have made a PCB! Not only will it be more reliable and look cleaner, but odds are you can shrink your project’s footprint down as well. In the end, most projects die on a breadboard after they are completed. Eventually you pull components for this project or that, or you end up taking the whole things apart and putting the parts back in your bins. This is where Carbide Copper comes in! Instead of either scrapping the projects after they’re done, or jamming them into a box with hot glue and a prayer — why not turn them into something you can keep? Turn those projects into something you can put on the shelf and pull back down when you want or need it! A recent project I completed is a perfect example of how Carbide Copper can help you level up Arduino projects. Vilaca’s tetris port for Arduino looked like a perfect starting point for a project, so I grabbed a breadboard and got started! This picture is actually an excellent example of the limitations of using a breadboard for a permanent project. Breadboards are meant to be used as a prototyping platform. 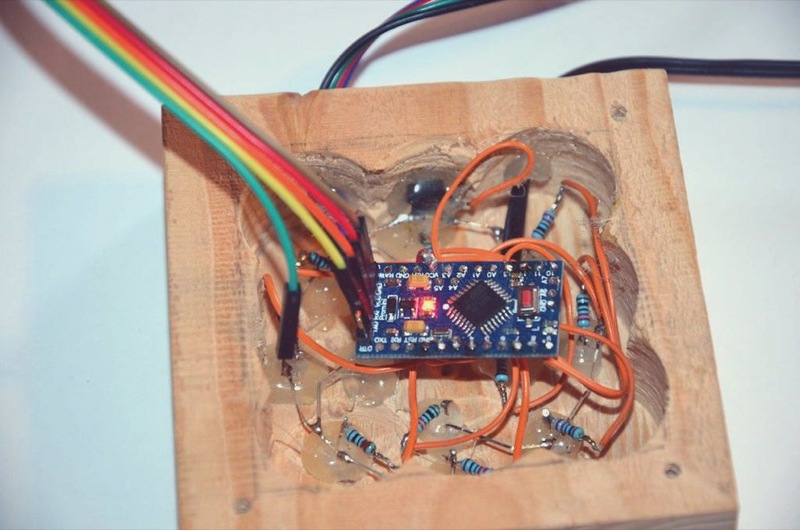 You prove your circuit on a breadboard, then move on to something more permanent. After I had figured the wiring out, and everything seemed to work as expected, it was time to move this over to something a little more sturdy. 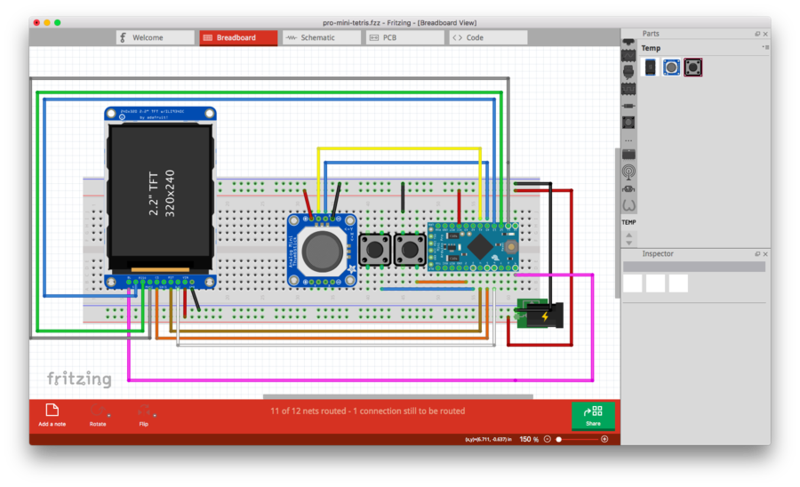 Fritzing is an open source software project that allows you to create circuits, virtually, the same way you would on a breadboard. Just drag and drop components, then connect with wires! Here is, to me, the amazing part. 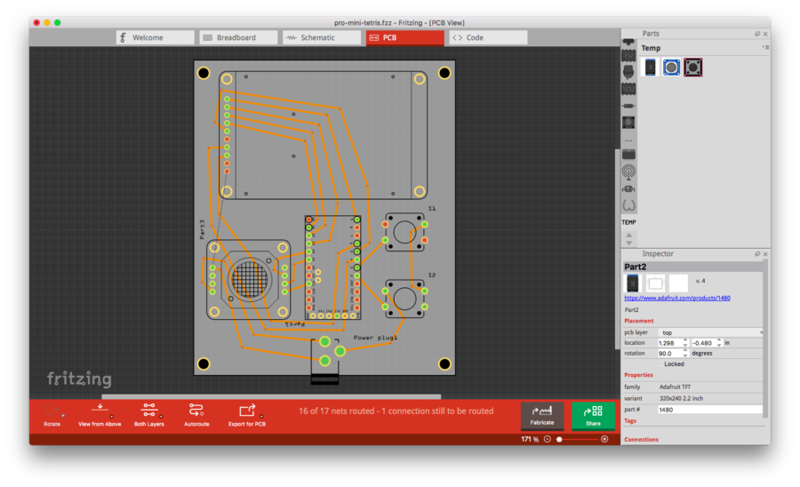 Once you have created your virtual breadboard, you can convert it into a PCB, by simply clicking the ‘PCB’ button on the top bar. The PCB will not be layed out like the picture shown above. In fact, all of the components will be scattered about the screen. 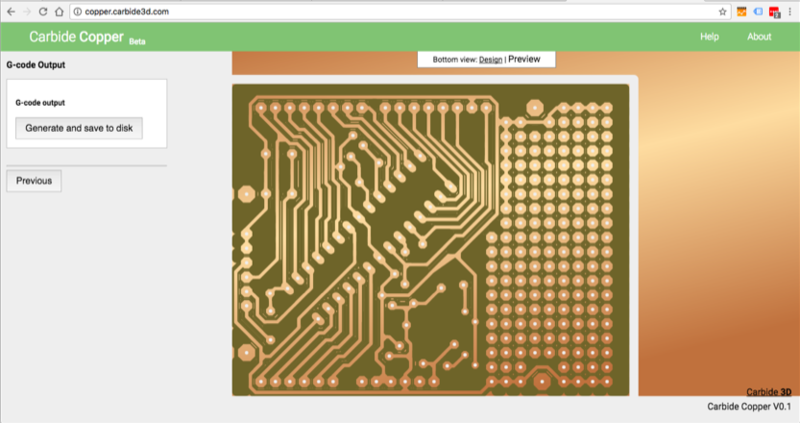 However, all of the connections you made on the breadboard will persist in PCB view. The parts can then be moved around the canvas, rotated, and placed in the gray area (representing the PCB ouline). Although there is an auto-router available, I have found that it is not the greatest, so you will more than likely need to route the traces by hand. Routing traces is a skill that is easily learned for single sided boards such as these. Once you are happy with the layout, you can export the PCB to GERBER format and save to your local computer. This is where Carbide Copper comes into the workflow. 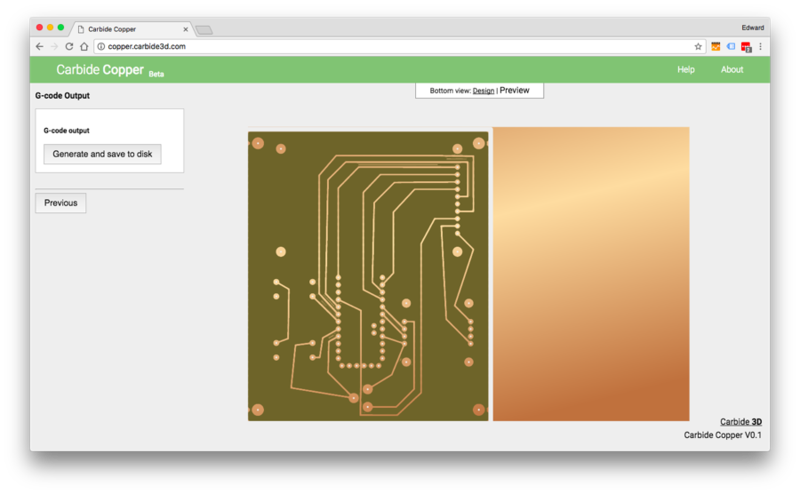 Now that you have proven the circuit on a breadboard, re-created that circuit with Fritzing breadboard, and created a PCB layout, it is time for Carbide Copper to do its magic. 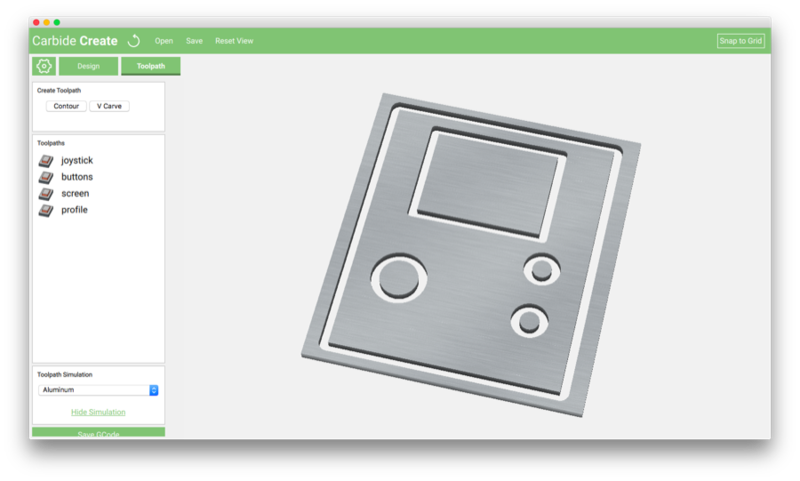 When you export GERBER files from fritzing, you will be given 8 separate files. Most of these files are not needed. The two files we are looking for are the bottom copper layer and the drill file. The bottom copper gives you your traces, and the drill file holds the location information for all of the holes in the PCBs. Carbide Copper walks you through the process of loading your files, selecting tools, and creating a cutout operation. At any time you can click the ‘preview’ button to see what your board will look like. You can select an option called ‘area rubout’ which will remove all of the copper that is not a trace (but will add machining time) or you can leave that option unchecked. Here is a comparison of the two — note this board functions identically with or without area rubout enabled. With all of the settings done, you can safely generate the G-Code to produce this PCB by clicking the generate and save G-Code button. With the G-Code generated, it’s time to load the file into Carbide Motion and actually cut the PCB! For this, you will need some supplies. 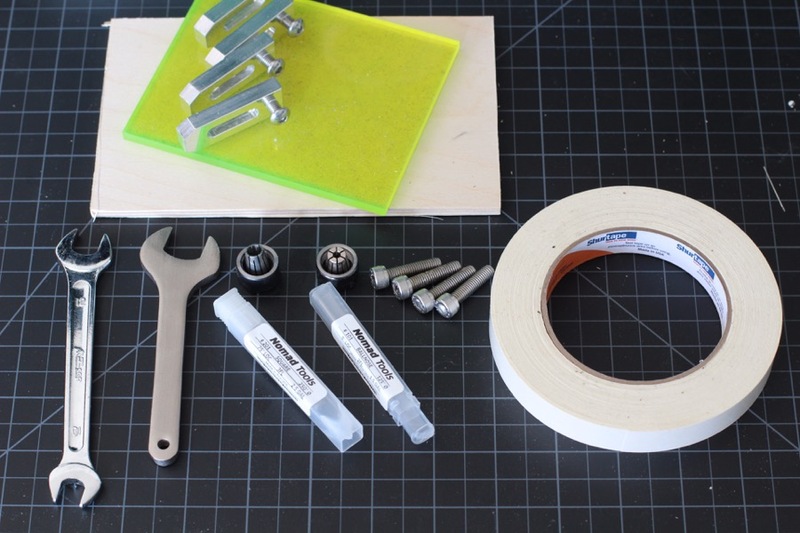 These are common tools that you will use for most PCBs you create. Shown in the photo above is a small piece of acrylic, which I use as a wastebaord for the FR-1 copper clad boards. The wasteboard allows me to mount the copper with double sided tape, and safely cut and drill all hte way through without ruining my larger wasteboard or cutting into my aluminum table. With the copper secured to the table, and the PCB engraver loaded into the machine, you can begin cutting the PCB. When the engraving is finished, you will be prompted for a toolchange to either create the rubout or drill the holes. After that is completed, you will be prompted for another toolchange to create the profile cut. Now it is a matter of placing your components into their intended positions, and soldering the backside of the connections. A multi-meter will come in handy here if you need to check continuity or connections. With everything wired up, you should have a fully functional project! Now that you have a fully functional PCB, wouldn’t it be great to create a beautiful enclosure to go with it? 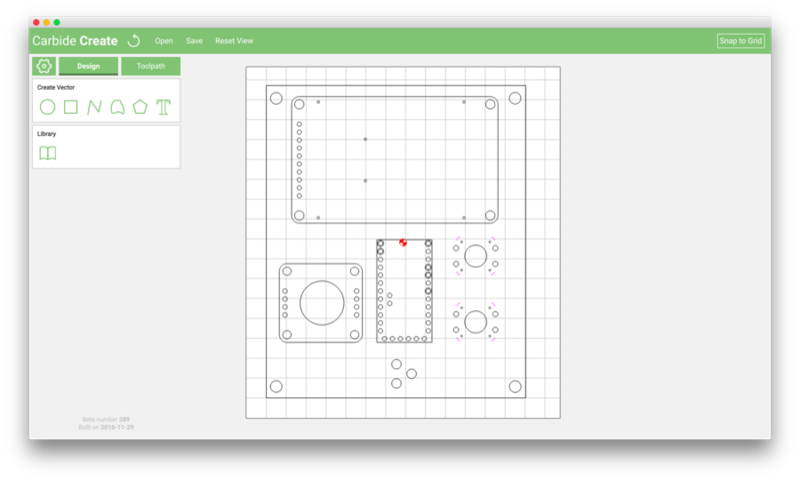 With fritzing, you can export an SVG of your project. And guess what? With Carbide Create, you can import an SVG. Open that file in Carbide Create. It should look something like the image above. The beauty of exporting the top silk to SVG, is now you can use a 100% to scale reference to create your enclosure. The image shown above represents the bottom of the enclosure. the Exported SVG file though, really comes in handy when you are creating the top section with all of the cut-outs. With the locations of each component known, creating the cover is as simple as selecting the shapes, and then the appropriate toolpath for each one.